What do we know about the Long Range Strike Bomber? The Pentagon will soon award a lucrative contract for its Long Range Stealth Bomber, billed as able to fly undetected at "any point on the globe." Yet the plane remains a mystery, leading some to believe it will be the war industry’s next boondoggle. The US Department of Defense has delayed announcing the company that will be tasked with developing the next-generation stealth bomber while maintaining intense secrecy surrounding the program. Some details, though, have trickled out ahead of the contract award, expected to occur in the coming months. The Long Range Strike Bomber will reportedly be designed to fly manned or unmanned while carrying both conventional and nuclear weapons. 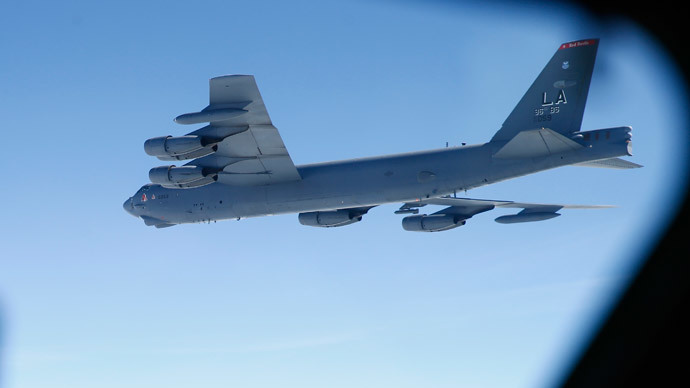 The Air Force will expect the plane to be able to fly undetected and hit a target “at any point on the globe.” The service wants to have operational bombers by the mid-2020s, according to The Washington Post. The bomber is dubbed as a nuclear deterrent needed to update an aging bomber fleet, which currently consists of the B-1B Lancer, B-52 Stratofortress, and the B-2 Spirit, which is the newest of the three, in use since 1994. "Our air leg is supported today by the B-2 and the B-52 aircraft," Navy Adm. Cecil Haney, commander of US Strategic Command, told the House Armed Services Committee last week, The Air Force Times reported. "The B-52, which was last off the assembly line in 1962, will be used out until at least the 2040 time period. It is very important we invest in the long-range bomber." The new bomber will replace the B-52, of which there are currently 76 in operation, The Washington Post reported, while 20 B-2s and 63 B-1Bs are in use. "In order to have the strategic and conventional capability, it's important that we recapitalize and move forward as the Air Force is investing in the long-range strike bomber," Haney said. Based on a Pentagon estimate from 2010 -- the latest regarding the Long Range Strike Bomber that did not take into account inflation -- each plane will cost at least $550 million, which puts the overall price at $55 billion. A 2014 Congressional Research Service report put that figure at $810 million each. Ultimately, the Air Force would like to have 80 to 100 of the newest bomber by 2040, according to The Air Force Times. These long range bomber’s cost predictions, though, do not take into account the heavy upticks in price that will inevitably occur in an exclusive industry that routinely operates with chronic cost overruns and delayed deliveries. For example, the F-35 fighter jet’s price tag has steadily risen from $233 billion since its announcement in 2001. Now, the jet is estimated to end up costing US taxpayers more than $1 trillion, factoring in maintenance expenses, though, the Pentagon said in August 2013 that the program’s estimated cost was “slashed” to a trim $857 billion. In addition, the original full-production target date was said to be 2012, though that has since been pushed back to 2019, according to ProPublica. To produce the program, the US Department of Defense will choose among the war machine’s most powerful companies: either Northrop Grumman, developers of the current stealth bomber, the B-2, or a partnership between Lockheed Martin and Boeing, according to reports. Northrop went as far as teasing its possible version of the stealth bomber in an ad aired during the Super Bowl a month ago. Representing a major prize among the competitors, the bomber may very well transform the industry based on whichever side wins the contract. In such a closed-off, high-barrier-of-entry arena, “nobody has entered the business of building aircraft since 1969 to any meaningful degree,” Richard Aboulafia, an aerospace analyst with the Teal Group, told The Post. For this reason and others, relations between the military aviation business and the Pentagon remain one of the coziest in Washington. The department, the report said, "may not have fully complied with the intent of" a 2008 law that aimed to stem some effects of the private-public insider relationship that is the lifeblood of the military-industrial complex.